Filters give report viewers a powerful way to slice data by specific segments. But filters with hundreds or even thousands of possible values to choose from were previously difficult to use, requiring scrolling through very long lists of filter items. We recently added a search feature within the filter component, letting users quickly find and select or deselect specific items. There are also scenarios when it only makes sense to filter a report on a single value, as filtering on multiple values would return confusing or nonsensical data. Report creators now have the ability to configure filters to allow for single-selection only. New Combo charts allow users to create a line chart with a non-time-based dimension on the X-axis (previously only time-based dimensions were supported). The new component can plot a single dimension with up to 5 metrics, or 2 dimensions with a single metric. Learn more about Combo charts here. Tables in Data Studio reports can now display clickable links! This feature introduces a new type of interactivity, as viewers can now be redirected to to relevant content outside the report. To use this feature, report owners must use a data source containing a column of URLs. Data Studio will detect this column and assign it to the URL field type (if automatic detection does not work data source owners can also set the field type to URL manually). Learn more about this here. The Data Studio team will continue to introduce new features and product enhancements. Have a feature request? You can view requests submitted by other users, upvote your favorites, or create new ones. Learn more here. The Data Studio team is constantly working on new features to improve the user experience for both report creators and viewers! In this blog post we’ll highlight some recent launches that you may have missed. in the report, without creating anything. 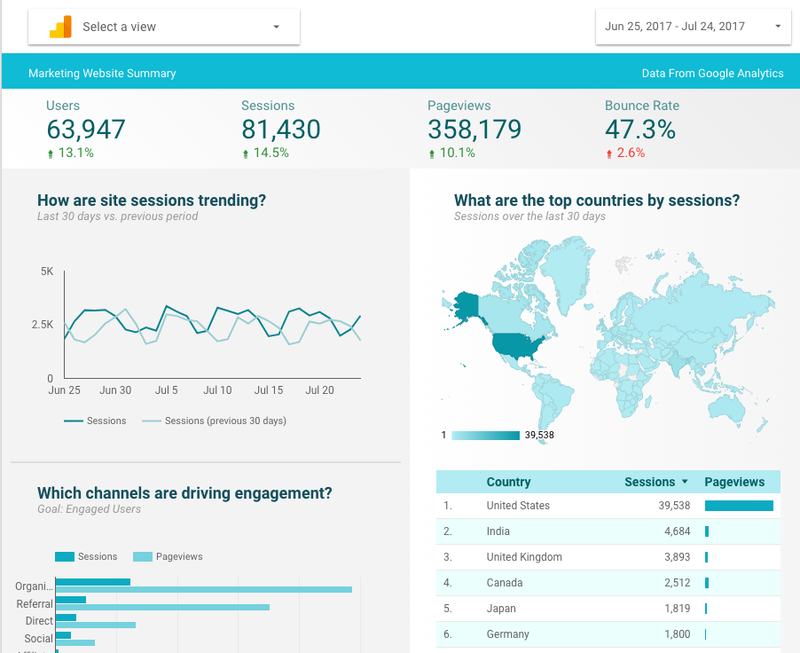 Are an agency or large organization with access to many Google Analytics views and do not want to create a Data Studio report for each view. 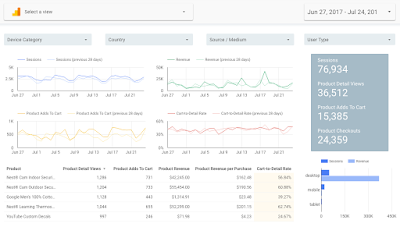 For example, if you have a set of charts and data you monitor every day, you can now build a report in Data Studio with those charts and data, add the Data Control, and quickly go between any of the views you have access to, allowing you to monitor your entire business very fast. Are a large organization with many websites across: different brands, different regions, or different business units, and want to unify reporting and KPIs across your entire organization. Now you can build a template report in Data Studio, add the Data Control, and share the report across your organization. 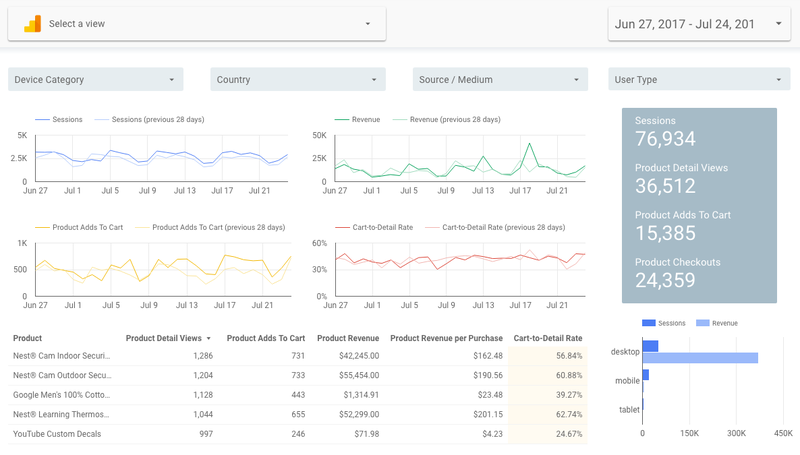 Every user will be able to see their data, in your curated report. The data control is public for all users. Read the Help Center for more details on how to use it. If you build an exciting report, please submit to our gallery, so we can showcase it. 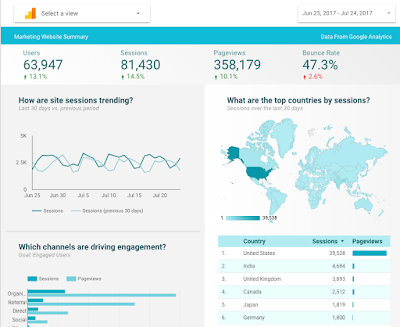 Today we’ve made it dramatically easier to view your Google Analytics data in Data Studio using the new Data control. When a report is created using the Data Control, all viewers can see their own data in the report, without creating anything. 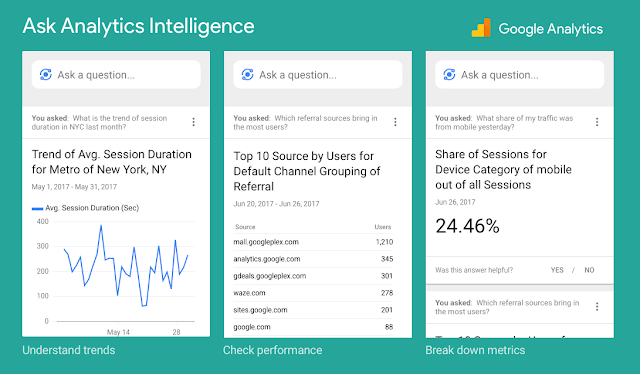 The ability to ask questions is part of Analytics Intelligence, a set of features in Google Analytics that use machine learning to help you better understand and act on your analytics data. Analytics Intelligence also includes existing machine learning capabilities like automated insights (now available on both web and the mobile app), smart lists, smart goals, and session quality. We've talked to web analysts who say they spend half their time answering basic analytics questions for other people in their organization. In fact, a recent report from Forrester found that 57% of marketers find it difficult to give their stakeholders in different functions access to their data and insights. 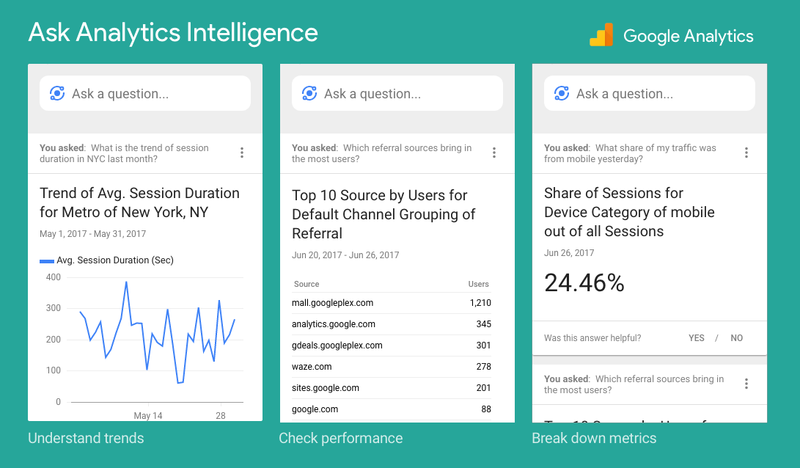 Asking questions in Analytics Intelligence can help everyone get their answers directly in the product ― so team members get what they need faster, and analysts can spend their valuable time on deeper research and discovery. Beyond answering your questions, Analytics Intelligence also surfaces new opportunities for you through automated insights, now available in the web interface as well as in the mobile app. These insights can show spikes or drops in metrics like revenue or session duration, tipping you off to issues that you may need to investigate further. Insights may also present opportunities to improve key metrics by following specific recommendations. For example, a chance to improve bounce rate by reducing a page's load time, or the potential to boost conversion rate by adding a new keyword to your AdWords campaign. To ask questions and get automated insights from Analytics Intelligence in our web interface, click the Intelligence button to open a side panel. In the Google Analytics mobile app for Android and iOS, tap the Intelligence icon in the upper right-hand corner of most screens. Check out this article to learn more about the types of questions you can ask today. Our Intelligence system gets even smarter over time as it learns which questions and insights users are interested in. In that spirit, we need your help: After you ask questions or look at insights, please leave feedback at the bottom of the card. Your answers will help us train Analytics Intelligence to be more useful. Our goal is to help you get more insights to more people, faster. That way everyone can get to the good stuff: creating amazing experiences that make customers happier and help you grow your business. Today, Google Analytics is taking a step toward that future. Know what data you need and want it quickly? Just ask Google Analytics and get your answer.